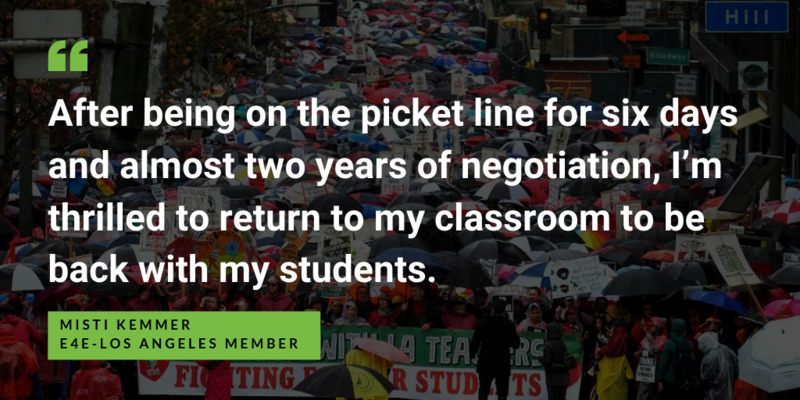 January 22 (Los Angeles) — Educators for Excellence–Los Angeles (E4E-Los Angeles), a teacher-led organization, celebrated this morning’s announcement that the United Teachers of Los Angeles (UTLA) and the Los Angeles Unified School District (LAUSD) have reached a tentative settlement agreement. Founded by public school teachers, Educators for Excellence is a growing movement of more than 30,000 educators, united around a common set of values and principles for improving student learning and elevating the teaching profession. We work together to identify issues that impact our schools, create solutions to these challenges, and advocate for policies and programs that give all students access to a quality education.